License plates can be obtained from the Department of Motor Vehicles in Wisconsin. All Wisconsin residents must register vehicles they intend to drive on state roads. When registering a vehicle in Wisconsin, it is possible to apply for a variety of different license plates. For example, personalized plates can include a custom plate number. All vehicles operated on Wisconsin roads require registered license plates from the Department of Motor Vehicles (DMV). DMV locations can be found in various locations throughout the state and applications to register vehicles should be done in person. The DMV requires new vehicle drivers to register immediately following their purchase. They have 2 days after purchase to display a temporary or registered license plate. For new state residents, it is mandatory to convert out-of-state vehicles with Wisconsin license plates. 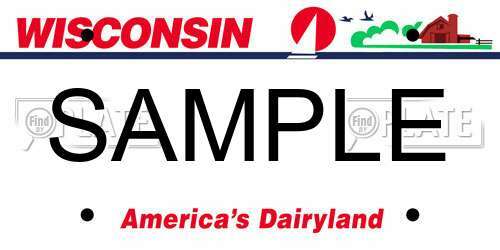 The standard wisconsin license plate have a white background with black and red lettering. There is an image of a farm and the quote “America’s Dairyland” across the bottom. The above plates require additional fees which varies by plate type. There are also temporary license plates which cost $3 and up to $5 for service fees. Some of these specialty license plates have eligibility requirements to be meet before they can be issued. For example, occupation plates require proof of employment. Disability license plates and placards provide people with disabilities access to designated parking spaces in the state. To be qualified for these plates or placards, medical proof may be required. Vehicles offering transportation services to people with disabilities. Most of the standard license plates issued by the DMV in Wisconsin can be personalised with a custom plate number. It is possible to check availability before applying to ensure a plate number is available. To perform a free personalized plate search by using the search bar above. Lost, stolen, or damaged license plates can be replaced by submitting an application to the DMV. Replacements can be provided for both license plates and decal stickers. It may be required to report stolen plates to the police and obtain a police report. When submitting an application, the required payment for the replacement plate fee is $10 for standard plates. All license plates must remain with the registered person, even if they sell their vehicle. License plates cannot be transferred to a new person. Instead, they can only be transferred to a new vehicle that is titled in the same name. If license plates are not transferred and now longer needed, it is legal to destroy the plates to prevent others from using them. It is not necessary to surrender license plates when they are no longer required for use. Going to the DMV office in person can provide new decals immediately. Online and mailed in renewals may require a couple weeks before the decals arrive. Typically, a vehicle is valid for 1 year (other options may be available for different vehicle types). All vehicles must have up-to-date decals that are clearly visible to avoid penalties. It is possible to look up license plates numbers in Wisconsin and other states in the U.S. When considering a used vehicle from a private seller, you can use this information to make an informed decision before you purchase.